When they had Bryan’s clothes upstairs and in Josh’s room, Josh laid the packages he was carrying on the bed and had Bryan do the same. He grabbed the chair that was at the computer desk. Bryan sat on the bed, then waited to see what Josh was going to say. Bryan simply looked at him for a moment. He’d sort of been steamrollered by Josh’s attitude on that before, and he’d unresistingly gone along with it. It was so comfortable doing so, and he’d allowed himself the luxury of not fighting it. But now Josh was asking him to agree with the plan, was in fact asking him to commit to it. How did he feel about that? Bryan really didn’t have to think about it. The choice was fending for himself at the mall or on the streets, or living in the safety and security of Josh’s house. Of scrounging for food the best he could, or having Josh and his dad feed him. Of letting his personal appearance, his clothes and hair and everything, continue to deteriorate, or allowing Josh to take care of him. It hurt his pride a little to accept Josh’s kindness, but he’d found his pride having been worn a bit thin after living like he had for the previous three weeks. “Stop it,” Josh interrupted. “I’m just setting some ground rules here, getting agreement on some things so we both know what’s what. We don’t need a lot of mushy ‘thank yous’ getting in the way. This is just simple, routine stuff. Okay. Next. We have a guest room. Across the hall. It has a nice bed in it. It has room for all your new clothes, it can be your private room. You can stay there. Or, you can sleep with me. What do you want to do?” By the time he’d finished saying all this, his voice was a little shaky. The surprisingly confident, almost assertive Josh who had begun this conversation by asking Bryan to sit down just a few minutes earlier had reverted and was again the shy, awkward, submissive Josh whom Bryan had met at the mall the previous day. Bryan didn’t answer right away. He looked at Josh and had no problem seeing the apprehension there. He could see Josh’s vulnerability. Josh was not a strong, self-confident boy. And he was now opening himself up to being hurt. Josh got a smile on his face that lit up the room. Then, as he realized what he was doing, his blush overpowered his smile, and he quickly looked away. “Oh, okay then. Sure, you can sleep in here with me if that’s what you want. There’s lots of room. Great. That’s good.” He stopped for a minute. His heart was racing, and he was afraid he might hyperventilate. Bryan’s answer had left him ecstatic. When he had calmed down, when he’d stopped glowing, he turned back to look at Bryan again. Bryan had a smile on his face, and seeing it, Josh couldn’t stop his own smile from bursting out again, too. Then Bryan stood up and offered him a high five. Josh jumped at the opportunity. Then they both sat back down. Neither had any inclination or the courage to discuss this further. “Okay, I was just asking. So we know where we are. Now, something else. This is a little more difficult. But we need to discuss it.” Josh paused and looked at Bryan, and Bryan could see his discomfort. He didn’t say anything, however. He just waited. Bryan let his eyes drift from Josh so he was just looking at the room, but not seeing anything at all. He hadn’t given much thought at all to this question. Josh was right. He hadn’t thought through an ending to this, other than having the vague thought that what he wished was that things with his dad hadn’t happened like they had. He wanted to be living with his dad and mom the way they’d lived together before his mom had died. He knew that wasn’t possible now. What did he want in place of that? He wasn’t sure. He didn’t know if he could live with his dad again, if he’d ever be able to trust him. They never had had a particularly strong father-son bond. What had happened that night had affected him deeply. He really didn’t know what he was hoping for now. “Okay. There’s no rush. As things settle down for you, you’ll be able to figure things out better. And that’s our goal for right now. I want you to relax. I want you to feel safe and comfortable. Then we can plan ahead from that point. We can make a new goal.” Josh stopped for a moment, as he was uncomfortable and not a bit used to talking so forcefully, to be giving his opinion to another boy his age. But there was more he felt he had to say, and as Bryan seemed to be listening, he felt he could and should continue. He did. Bryan’s voice was quivering now, and Josh could see tears forming in his eyes. By now, Bryan was openly crying. Josh moved over and sat next to him on the bed and put his arm around him. They sat like that for a few minutes. At first, Bryan just started crying harder. Eventually his crying eased, and then finally stopped. Bryan remained sitting slumped on the bed. Josh moved in front of him and started unwrapping their purchases, taking them out of bags and laying them on the bed. Then he crossed the room to his dresser and began clearing his stuff out of the top two drawers. He rearranged his bottom two drawers and put some of his stuff there, and he took some to the other room. In a short while, Bryan was up and helping him. When they finished with the dresser, they did the same with the closet. It didn’t take long, and they were done. “That’s pretty good. We’re going to have to work out who gets the computer when for schoolwork. Of course, since it’s mine, I get it in the afternoon and evening, and you can use it between 2 and 5 AM. I think that’s fair.” Josh looked up at Bryan, hoping he’d smile. Josh started laughing, and Bryan joined in. They went downstairs and found Dr. Warren working on dinner. He seemed less distracted, to be paying attention to what he was doing this time. The potatoes had been washed and were in the oven in their skins, the steaks were marinating in olive oil, garlic, balsamic vinegar, salt, pepper and tenderizer and a green salad with slivered red onion, green olives and cucumber slices was in a bowl on the table. The boys began setting the table, and Dr. Warren fired up the grill. “How do you like your steak, Bryan?” he asked. “Huh?” Bryan was a little shocked at Dr. Warren’s outburst. He stepped back a half step, concern suddenly showing on his face. Dr. Warren scowled at Bryan. “A well done steak is an abomination, young man! Some poor cow gave its life just so you could appreciate the wonderfully moist, juicy and flavorful meat it grew just for you, and you’d spoil it that way? There’s nothing ‘well’ about well done! It cooks all the juices out of the meat, it makes it tough, it takes away the delicate flavor. It’s like eating shoe leather.” Dr. Warren’s voice suddenly went from scathing to soothing and persuasive. “Tell me, son, have you ever had a steak cooked rare?” he almost cooed. Bryan could see the twinkle in Dr. Warren’s eye, could finally hear he wasn’t being serious. He didn’t know the man at all, but responded to the teasing. He was warming up to Dr. Warren. He thought he should join in. “So then tell me, sir, how do you like your steak? “Tell him how you order it, Dad, you know,” prompted Josh. “Of course he does! No self-respecting boy in this house would eat it any other way!” roared Dr. Warren. Bryan raised his eyebrows at Josh, tacitly repeating the question. “Sick! Sick! Why, the very idea! Okay, I’ll do it rare. I think you’re in for a real treat tonight, young man. A life-altering experience.” And he smiled. At dinner, Dr. Warren opened the bottle of wine. Josh pushed his glass toward him. His father looked at him, then at Bryan. Bryan promptly pushed his glass forward too. “All the more reason,” replied his father, then grinned. Dr. Warren poured them each a half glass of wine, and then, after waiting for Bryan to take a bite, asked him if he wanted the steak cooked longer without any pressure at all. Bryan rather cautiously chewed a couple times, then looked at Dr. Warren with his eyes opening wide. Over dinner, Dr. Warren asked about their day at the mall. That was a subject neither boy was comfortable talking about, and Bryan got to see Josh doing some pretty skillful tap dancing around the truth. So, accepting the challenge, Bryan jumped in, making up some stuff of his own, and by the end of the meal they’d begun coloring and embellishing each other’s stories to a degree they both found remarkable. They’d gained a new respect for each other’s ability to be a kid. After Bryan had thanked Dr. Warren for the meal and the boys had finished the dishes, Josh asked Bryan if he had any homework to finish. Bryan realized he did, and they both went upstairs. Josh got his books and set them on the bed, then started to take off his pants. He’d loosened his belt when suddenly he stopped and blushed. Bryan was watching him. “What’s the matter?” Bryan asked. Both boys grinned at each other. Bryan loved the fact Josh seemed secure enough now to be able to kid with him. The boy he’d met at the mall the day earlier had seemed entirely unable to do that. The room was silent other than pages turning and computer clicks for the next two hours. Josh finished his homework well before Bryan did, then simply picked up a book he was reading and started in on it. Eventually, Bryan finished, then asked Josh if he wanted the computer turned off. When Josh said yes, he went through the shutdown procedure. “You ready for bed?” Josh asked. The boys both showered, then put on clean boxers and went to bed. After discussing it, Josh set the alarm for 6:45. Then he turned out the light and got in bed. Both boys were on their backs. Josh felt a little nervous. He was tired, but this was something new for him. This wasn’t like the previous night when Bryan was almost asleep before Josh even got in the bed. Now they were lying in bed together, the light was off, and neither one was asleep. Josh felt tears forming in his eyes. Bryan had just said the absolute best thing he could imagine hearing. He felt powerful emotions in his chest. Without thinking, he rolled over and hugged Bryan. He was shocked to feel Bryan reach out and hug him back. Josh didn’t want to let go, and Bryan didn’t seem inclined to do so either. After a minute of this, both boys realized their arms were getting tired. Neither wanted to let go, but had no choice. Both relaxed their arms. “I’d like that too,” was the soft response from Bryan. And so, Josh rearranged his arms to a more comfortable position, and felt Bryan do the same. Both boys wriggled a little, getting comfortable. Then, with a huge smile on his face and a happy heart, Josh fell asleep. If you enjoy this story, please let me know! Authors thrive by the feedback they receive from readers. It’s easy: just click on the email link at the bottom of this page to send me a message. 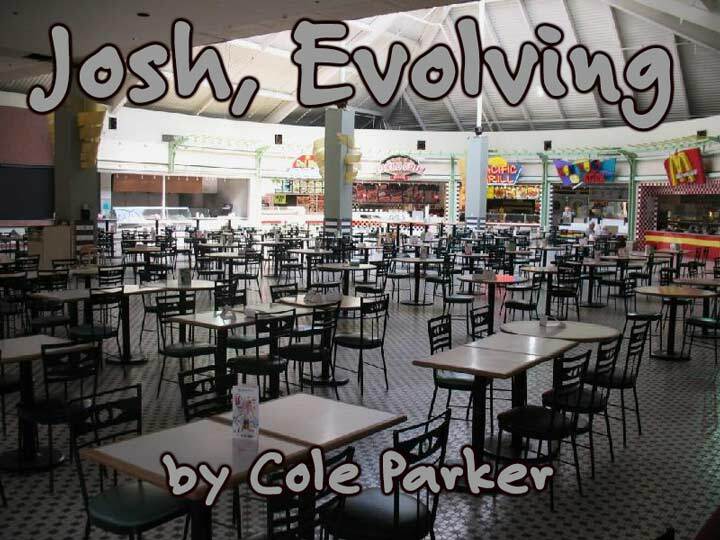 Say “Hi” and tell me what you think about ‘Josh, Evolving’ — Thanks.